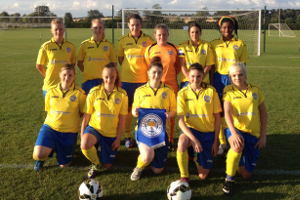 Leicester City Ladies started off a brand new league campaign at their new home of Leicester Road Stadium with a point against a tough Mansfield Town side. 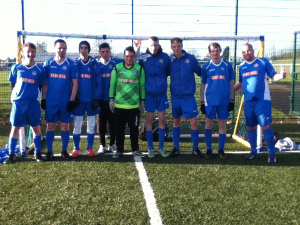 The home team were stretched with injuries but put on a hard working display. The game could not of started any worse for the home team and Mansfield Town were ahead inside five minutes. 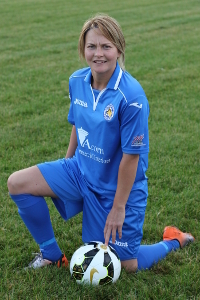 Leicester City Ladies response was excellent and Becky Preston fired home with a fine finish. Second half both teams had clear chances to take the lead but a resilient display from both sides made the 1-1 score line a fair result. Overall Leicester City Ladies are off and running with a point on the board in what was a tough opening fixture played at a good pace. City now look forward to Nottingham forest in the League cup qualifier on Sunday at Leicester Road Stadium with a 2pm kick off. 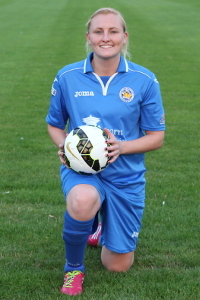 The match day programme was dedicated to Gemma Ball for 12 years continuous playing from juniors to seniors with Leicester City Ladies. 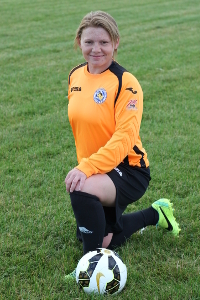 Gemma has been with the club a lot longer than myself but I have been fortunate enough to be the senior manager at the time she was ready to move up. I gave Gemma her first starting appearance and this was at a difficult time with the team fighting to avoid relegation. 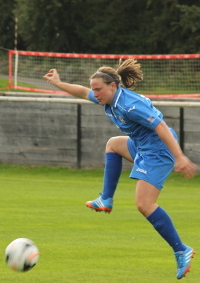 I will also remember her stepping up to take a vital penalty in a game the team had to win, showing no fear Gemma calmly struck it into the top corner without realising what an important goal it was in our history. 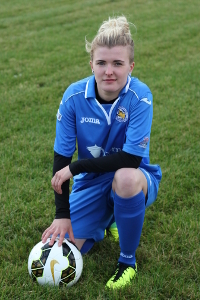 Today Gemma makes her own history she is a product of our development and a prime example of players being coached in the right way and developed through the system to play at the highest standard. 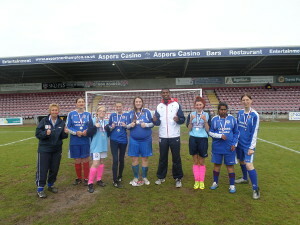 I hope this encourages more players to come through the player pathway after the example Gemma has set. 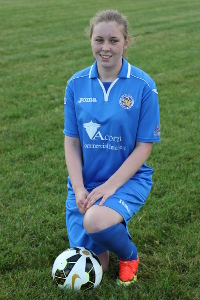 I have watched Gemma grow as a person and a footballer and I hope she keeps the Leicester City Ladies blue on for at least another ten years. 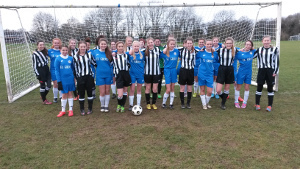 A young under 21 Leicester City Ladies side were invited to play the Independent Schools Football Club National squad at the wonderful facilities of Oakham School. 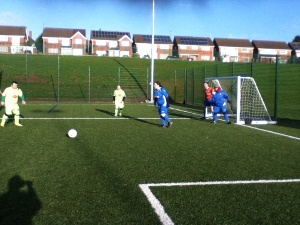 ISFA went into a quick one goal lead before Kayleigh Needham equalised with a stunning strike. 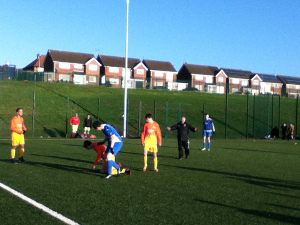 Isfa went on to run away with the first half leading 3-1 at half time. 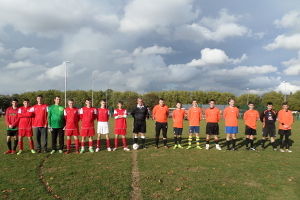 After a good half time team chat to plan for the second half it could not have started any worse as a dubious decision led to a free kick which ended up making it 4-1 much to the amazement of the players. 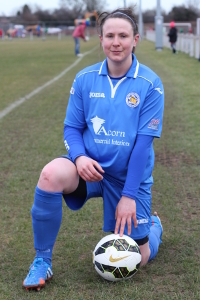 Leicester City Ladies then showed immense quality and change of system saw them score three goals in ten minutes, Ball and a Needham brace completing her hat trick showed great character from the away side. 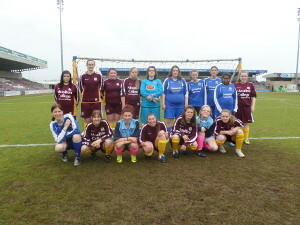 Some great individual performances were on show, Rowlands kept City in the game in the City goal with some confident keeping. 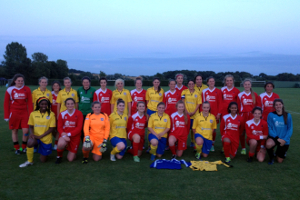 Hutchings at the back and Ayesha on the wing caused no end of problems. However all over the City 11 were immense. 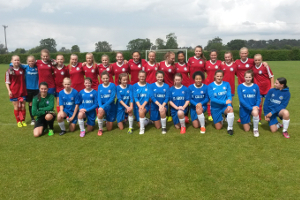 A big thank you to the ISFA for choosing Leicester City Ladies to play and a big thank you to your team for their efforts on the day. 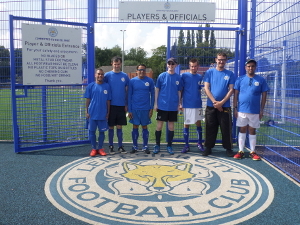 Leicester City Woodgate Inclusive players were invited down to the LCFC Training ground on Monday 4th August to take part in skills sessions and small sided games with David Eassom, Disability Officer at LCFC Football in the Community. Sky TV cameras were on hand filming the work of the Football in the Community scheme as they continue to work in and support many different areas of grass roots football and as part of City’s Premiership status this will continue to grow. 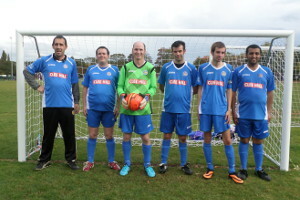 Only seven players were asked to attend from our Red Division Squad. 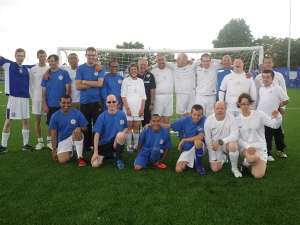 The players really enjoyed the experience playing alongside members of the Achieve with Us project based in Hinckley. 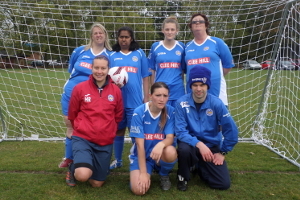 Leicester City Ladies Seniors start training on Tuesday 24th 7.45-9.30 at Leicester Road Stadium, Hinckley, LE10 3DR. 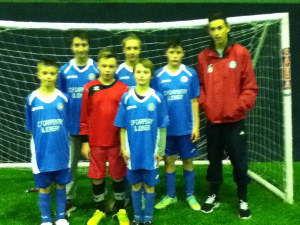 Thursday 26th follow up ball work session 8-9 at Aylestone Leisure Centre 3G. 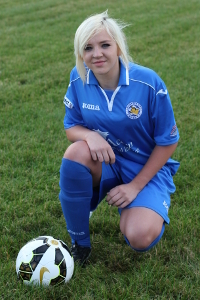 Anybody interested In trials with Leicester City Ladies during this period please contact Matt Cook on 07900901755. Leicester City Ladies are looking for volunteers who would like to be involved in one of the highest standards of Womens football. All applications considered by football based interviews, coaching qualifications FA Level 2 and above preferred however all applications considered as the club would be prepared to invest in suitable applicants. 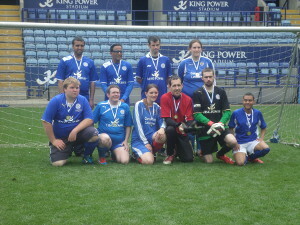 Leicester City Ladies Football Club AGM will be held at The King Power Stadium on Thursday 22nd May starting at 8pm. 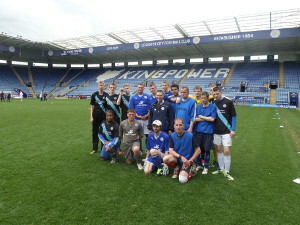 Managers and players should report to the main LCFC reception and the allocated room will be advised. 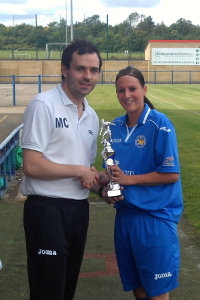 Leicester City Ladies Chairman Steve Crayfourd recently met up with X Factor winner and former player Sam Bailey. 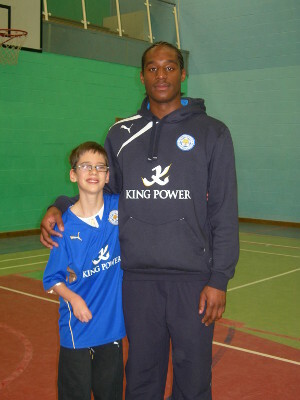 Leicester City FC’s U18’s Captain, Herve Pep-Ngoma visited our Junior & Youth inclusive Football Squads training session and was delighted to be able to teach the youngsters a few tricks of the trade. 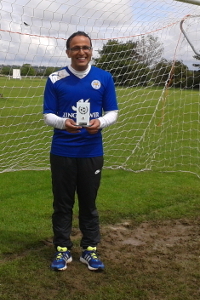 Herve has been in the LCFC Academy since he was a youngster and shows great potential for a very bright future in the professional game. 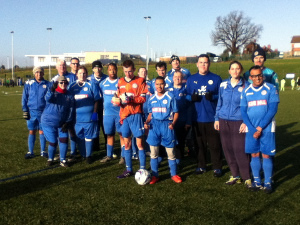 The Leicester City Woodgate Inclusive Football Teams, provide regular football training and also matches in the Leicestershire & Rutland Inclusive Football League. 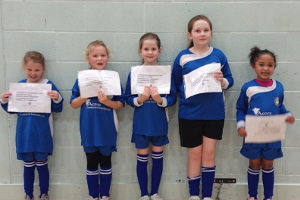 The Junior & Youth Section is run by head coach Paul Gibson, who has many years of experience working within the game, both as a volunteer and as an FA Skills Coach. 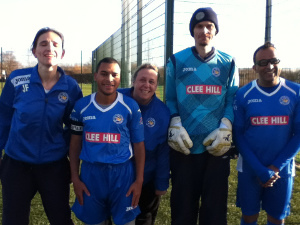 Paul has been mentoring coaches Harry Gethins and Bradley Sharp who are both FA Level 1 Coaches and do a great job volunteering to support our Inclusive Footballers who have a variety of special needs or a physical, sensory or learning disability. Luke Wardle one of the valuable team players is an absolutely mad Leicester City FC fan and was very pleased to have his photo taken with Herve. 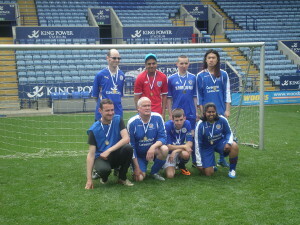 Luke is a season ticket holder at the City and also goes to watch many of the LCFC Academy and Development Team games. 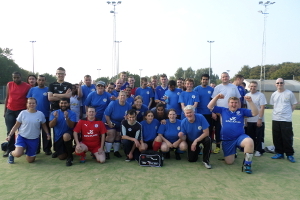 Herve was thrilled to be asked to go along to the Inclusive Football training sessions and said “It was a real pleasure to meet all the players, they showed a lot of skill and enjoyment for the game of football, I really enjoyed meeting them and I hope they enjoyed it too”. and every Monday until the End of the Season. 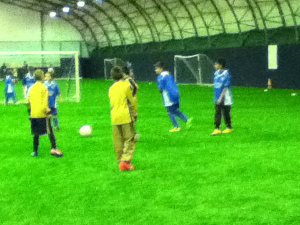 At St. Margaret’s Training Pitch. 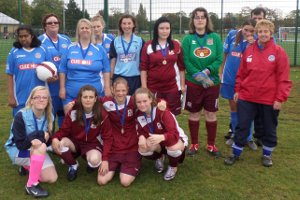 – Are you the Goalkeeper for one of our Leicester City Ladies teams? 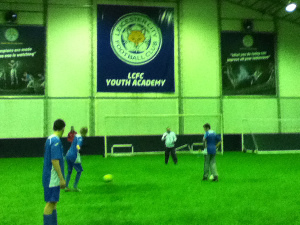 Then come along and learn off ex Leicester City Goalkeeper Russell Holt. This is a great opportunity to improve your skills. ALL AGE GROUPS WELCOME. 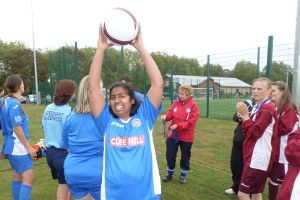 – Are you one of the Strike Force for one of our Leicester City Ladies teams? or maybe you are the attacking goal scoring Midfielder who wishes to score more goals? Then come down to our own club Striker/Goal Scoring Workshop. 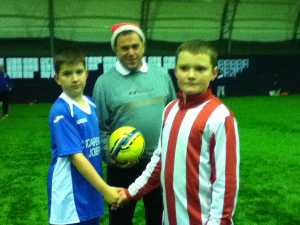 Hosted by First Team Manager Matt Cook with a Guest Coach as the Instructor each week. ALL AGE GROUPS WELCOME. For more information on both sessions contact Leicester City Ladies Football Development Manager Matt Cook using the email link at the top of the Development page. 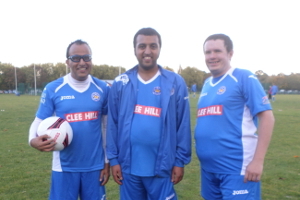 As chairman of LCLFC, I am always looking at ways to improve our club. It has always been my aim for us to be the best community football club in the Midlands that caters for the women & girls’ game; and with our long history and legacy, being the oldest club in the country being formed in 1966, I feel the club has now reached a milestone. In 2016 we will be celebrating our golden anniversary; what better time to move forward. As a club we have been looking for someone who can communicate between myself and the club on football, business and development matters. In recent times, due to family commitments, our first team manager Matt Cook has had to take a slightly different role; he is at present overseeing the senior section with the coaching team taking care of team affairs. Although we see this as a short term measure for Matt, as he will lead us into 2014/15 season, it has opened an opportunity in the immediate future to benefit the football club. As a committee, we have needed a football business development manager for several seasons and I have offered this vacant role to Matt; which I am delighted to say he has accepted. Matt has my full backing and support. Matt’s selfless devotion to LCLFC over the last five years has led me to make this appointment. He will use his usual sound judgement to promote innovative ideas with great enthusiasm. I ask for all at the club to give Matt their complete support, and welcome him, and his ideas that I’m sure will be of benefit to all. 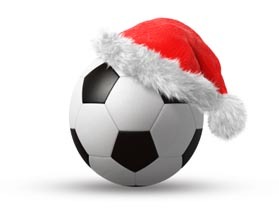 To develop and enhance the senior football structure in preparation for the clubs promotion to the newly formed Championship level; the highest level of the winter game. 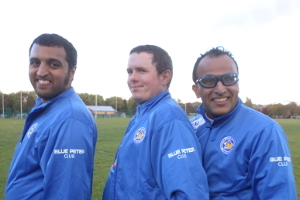 To create closer links between all sectors of the club. To enhance advertisement and sponsorship investments. 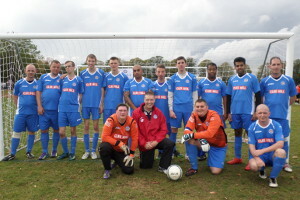 To look into ground and training facilities for the club. To develop our hard working coaches and find ways to achieve this to give something back to our many volunteers. To develop a player structure and a pathway for all. To develop a schools’ project. Matt will be in constant contact with myself on any ideas so I can oversee all projects. 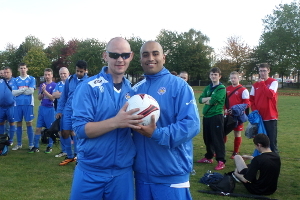 I want to thank Matt for taking this vital role as we consolidate and develop our club. Let’s all work together to secure our long term future. 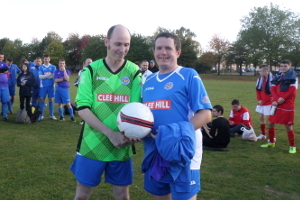 Any ideas you wish to put forward, speak to Matt personally or email either of us through the club website. 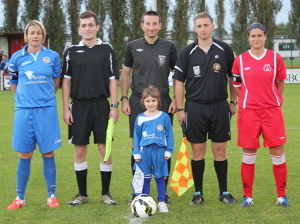 Leicester City Ladies first game of 2014 was against lowly Mansfield Town. An earlier game in the season at Field Mill had ended 2-2 and with Town scrapping for survival this was going to be no easy game. However City seemed to make light work of their opposition as Sam Clarke and Becky Preston goals saw them 2-0 up at the interval. A quick third for City from Preston again in the second half and the home team was coasting. Credit to Mansfield who staged a remarkable come back however, a dubious penalty was followed by two quick goals to stun the promotion chasing outfit who had seen only three teams take league points from Linwood Park in two and a half seasons. Sadly for the visitors a passionate City stole the points through Preston again who finished off a sound display with a hat trick. Overall a game City may should of been more comfortable in but three vital points none the less to keep the pressure on in the Combination and a unbelievable home record once again secured on a rainy day at Linwood Park.